There is one post filed in Raiders Jerseys. The Oakland Raiders need to win the offseason to get back on top in the AFC West. Here are five questions the team should be asking before free agency. With the coaching staff in place and the NFL season winding down, it’s time for the Oakland Raiders to get to work for the 2018 NFL offseason ahead of them. The Silver and Black went a miserable 6-10 in 2017, leading to Jack Del Rio and his entire staff’s firing at season’s end. Owner Mark Davis brought back a familiar friend in Jon Gruden to save this sunken ship beginning in 2018. Gruden will bring a fiery passion for football and accountability to this talented, but undisciplined team. He will be in charge of getting the most out of this offense. So much of that hinges on franchise quarterback Derek Carr‘s continued growth and development as a passer. It will take time, but let’s have faith that Chucky and Carr can lead the Silver and Black to the promised land someday soon. As for the defense, that will be incoming defensive coordinator Paul Guenther’s greatest challenge. He took over the Cincinnati Bengals defense once former coordinator Mike Zimmer got a head coaching gig with the Minnesota Vikings in 2014. Guenther couldn’t pass up the opportunity to work with Gruden and rebuild this Raiders defense from the ground up. Before Gruden, Guenther or anybody on the Raiders staff can get to work on the grass doing what they do best in coaching, the organization must ask itself a handful of questions to best get ready for the offseason ahead. Here are five that we have to believe the Raiders have to answer this offseason. So who is going to be backing up Derek Carr? This one will get overlooked, but that doesn’t mean it isn’t important. We know that Carr is the star signal caller this team needs to get back to the Super Bowl. However, what if he gets hurt again? He had his 2016 season end due to a broken leg. Carr suffered three transverse processes fractures in his back in Week 4 of 2017. Let’s just say he wasn’t the same player after that road loss to the Denver Broncos. More than ever, it is imperative that teams have a capable backup quarterback on their roster. 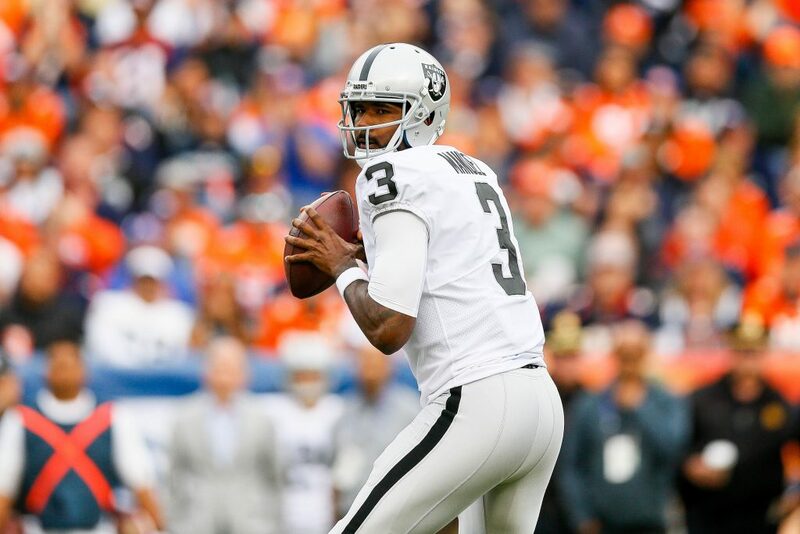 Last year, the Raiders kept three quarterbacks on their active roster throughout the year: Carr, former failed Buffalo Bills starter EJ Manuel and former mid-round pick Connor Cook. Manuel played decently for a game and a half in Carr’s absence. Cook mostly rode pine. Gruden and offensive coordinator Greg Olson need to ask themselves a three-pronged question with regards to who will be backing up Carr in 2018: Should the Raiders re-sign free agent Manuel? Can we trust Cook to be the primary backup to Carr in 2018? Who else could the Raiders target in the backup quarterback market in free agency? Re-signing Manuel might be the best play. A team can tread water with him under center at starting quarterback for a few weeks. However, he came to the Raiders to work with Todd Downing, who has since been relieved of his duties. Going with just Carr and Cook seems slightly terrifying. Other potential free agent backup quarterbacks the Raiders could target include Drew Stanton, Chad Henne or Kellen Clemens.